We are creatures of habit. As much as we say we don't mind change, it touches something inside us when it happens. That something doesn't like the having to learn the new, the different. I finally found a wallet and a purse and last night, after two weeks of the new sitting on the table in the living room, I migrated the contents of the old to the new. The old is on the left. The clasp on my fabulous zebra striped clutch just refuses to close. Perhaps, if I were more handy than I am, I could figure out a way to make the clasp close as it used to but I just decided to buy new. The new and slightly smaller clutch is on the right. You might, if you scan the image, see a price tag of $22. I can assure you I did not pay $22 for that. It's not worth $22. It was certainly worth $11. At the same time, I decided to replace the brown purse. The fake leather on the straps is cracked and is starting to sluff off in tiny chunks. I walked all over the purse section at JC Penney looking for something I liked and which met my needs. The brown purse has pockets all over it. What I'm going to miss the most is that side pocket you see to the right. I keep my cell phone there. It's so easy to reach over and grab the phone. There is an interior pocket in the blue purse where my cell phone will sit now. There will be a learning curve to get used to the new purse. 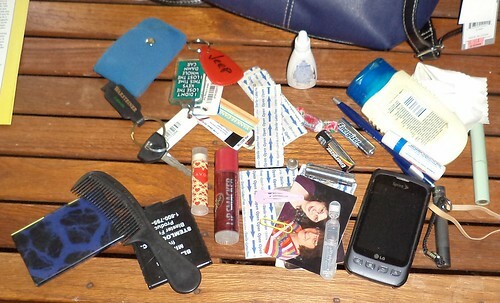 All of this was in the brown purse in various pockets. 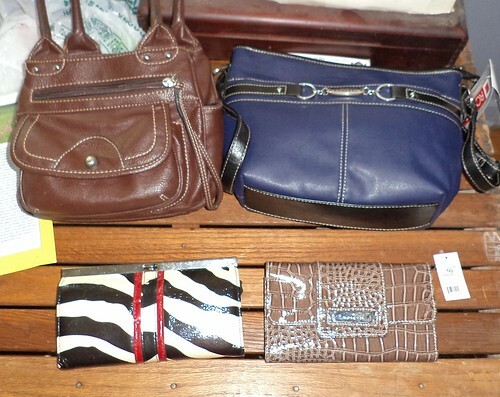 I don't have as many niches in the blue purse so I had to look at things critically. The batteries are to go into the recycling box at work. The red key chain is for when I drop my car off to be serviced and leave it overnight. Do I really need the extra car key in my purse? Well, probably. In the event I lose my main set, I have a car key and in the car is a house key. I'm rather out of luck with office keys however, but I can get home. The lipstick, a light green tube at the far right, I'd forgotten was in the bottom. That was put away. Do I need all the bandaids? 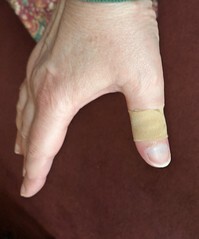 Well, back at the end of April, when I went to Prairie du Chien for that huge job for work, I was going through the file of paperwork I carried with me and got a rather nasty paper cut on my thumb. Do I need to carry all those band aids? Probably not, but I was very grateful I had them. Now comes the learning curve. Please be patient with me. I know I have it, just where it is in the bag is the question. There are fewer places for things to hide, which may be a good thing, but that also means there's more stuff in one place to sift through.